Decision Coaching 3.0: What happened to the Puritan Gift? From time to time I will publish something under the heading “Decision Coaching 3.0.” The 3.0 designation means the blog post is something I think will be valuable to both executives and coaches. Typically it will be something about business culture or management trends. This book is an elephant in a world of squirrel-sized business books. Edwards Deming would love this book. For several well written, in-depth reviews go to Amazon.com. Amazon reviewers like David Howard give it 5 stars. 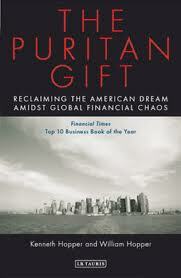 The 2 authors of “The Puritan Gift” are brothers. Ken Hopper is a life long professional engineer with an interest in business history. Will Hopper is an investment banker. Their partnership is a model for what will have to happen if American industry is going to recover. We need leaders who have hands on knowledge about how products are designed and built. We need engineers who understand the craft of negotiating the world of modern finance. Business has an over supply of clever, confident MBA’s narrowly trained in the intricacies of mergers and acquisitions, accounting, and finance. 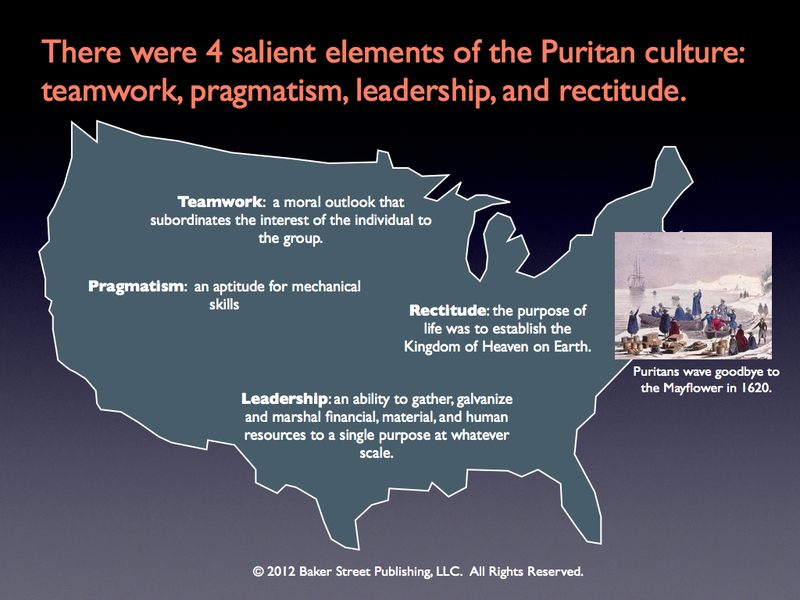 We need leaders (and followers) who manifest the Puritan values of Rectitude, Pragmatism, Teamwork, and Leadership. I’ve summarized some highlights of the Hopper book in two graphics. 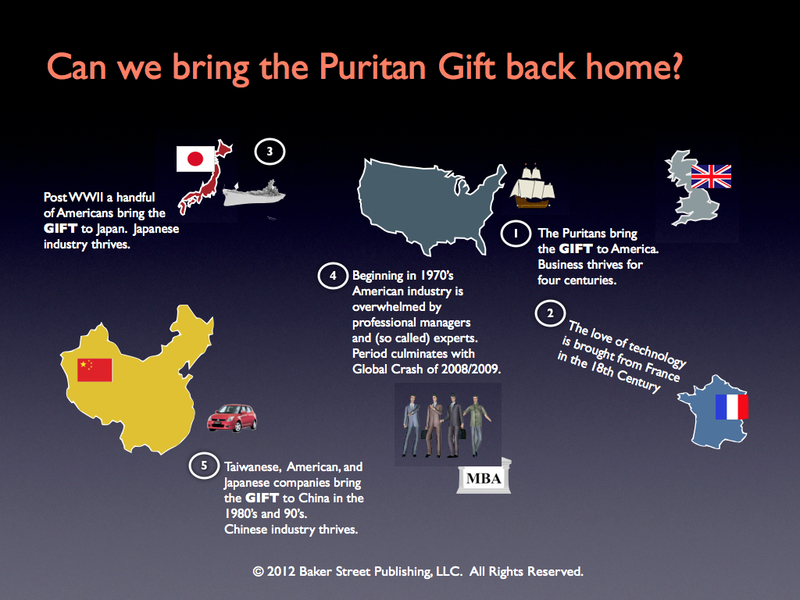 The first slide answers the question, What is the Puritan Gift? What culture did the Puritans bring with them from England in 1620? See the slide on the left. The second is a visual summary of the history that the Hopper’s so eloquently review in the book. (See the slide on the right.) The Puritan Gift came to America on the Mayflower. The gift was given to the Japanese after WWII by a handful of Americans who were part of General Douglas MacArthur’s occupation. More recently the Gift has been passed to China. Where the Gift goes, industry thrives. Japan and China have been realizing the fruits of the Puritan Gift. Meanwhile American industry has been overrun by professional managers and (so called) experts. For the most part these people 1) have no real higher purpose, 2) they have no aptitude for mechanical skills; 3) they have a moral outlook that puts self interest paramont; and, 4) they have little ability to gather, galvanize and marshal financial, material and human resources to a single purpose at whatever scale. Hewlett-Packard is an example of a company that was built on the Puritan ideals. The founders, Bill Hewlett and David Packard, were hands on engineers and managers. They fostered a culture of of teamwork. Today their legacy of making the world a better place continues through their support of Stanford University and many other good causes. Somewhere in the 1990’s Hewlett-Packard turned to professional and (so called) experts for leadership. The goal was growth. Today I read in the San Francisco Chronicle that HP is considering 25,000 job cuts. Under the leadership of professional managers they shed their instruments group (a bastion of engineering pride) and acquired Compac and EDS. Their recent tablet (read iPad) launch was like watching the Keystone cops. They launched the tablet product with an unfinished operating system, aborted the product launch, fired the CEO, hired a professional manager CEO (Meg Whitman), and announced that they would resurrect the tablet program. The company deserves better. I believe decision coaching can be an effective way of moving business back to a culture of leadership, pragmatism and teamwork. Coaches can be developed from within the organization. Preferably they are people with strong technical training and experience. Coaches can move teams away from the winner-take-all, advocacy-based negotiation taught in most business schools. A good coach can move a team toward mutual learning and design.